DETAILS What you need is stuff, old magazines, glitter, yarn, greeting cards, the only limit being your imagination. Fill a basket with stuff choices for the children to rummage through. If you're a grandparent you should always collect stuff, you never know when it will come in handy. Include colored construction paper in the basket for the collage base. 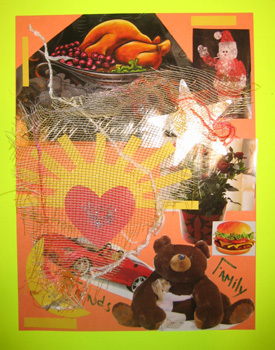 This should begin as an activity of thanks, cutting out pictures that express what you are thankful for. It should end as a design activity. Once you've gathered your materials stop to think about how you're going to lay them out on your paper, how you're going to decorate them, how you can make a unified whole. Experiment, and when you're satisfied, glue down your materials.